Posted on June 15, 2015, 8:01 pm, by Thomas Hawk, under Adobe, stock photography. 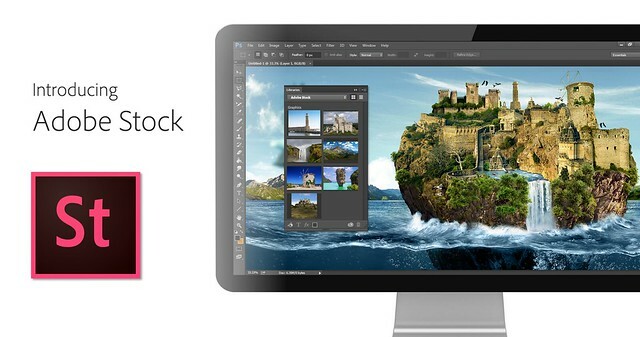 Today Adobe is announcing updates for their Creative Cloud 2015 Photography package as well as the launch of their new stock photography offering Adobe Stock. I saw a demo last week of the new Creative Cloud enhancements. The enhancement that I liked the most was a new slider in Lightroom for haze and dehaze. With the haze slider you can now reduce unwanted haze in photos or add haze back in if you want more of an ethereal foggy type mood. I think that this tool will be especially dramatic when working with long exposure photography where you have clouds or low fog and want to get the mix of fog to subject just perfect. Photoshop is also adding in an additive noise function where you can produce more camera like realistic bokeh and blur noise when desired, making the transition in blur more natural. The Photoshop healing brush also now heals in real time and is faster than previous versions. These feature enhancements and updates will not be available to the current desktop versions of Lightroom and Photoshop, they will only be available for Adobe Creative Cloud subscribers. This is in line with Adobe’s previous stated goal of providing fast and rapid real time updates and upgrades to their subscription customers. I’m assuming that eventually these new enhancements will make their way to desktop upgrades/updates, but at present Adobe seems to be focused on providing the best and most current features available to their subscription customers. There are also additional features being launched for the mobile versions of Adobe products including better tone and vignette adjustment for Lightroom mobile and an Android version of Photoshop Mix. Adobe’s Creative Cloud photography package costs $9.99/month and you can subscribe to it here. They also offer a 30 day trial for you to try out Creative Cloud to see if it is right for you. In addition to the improvements in Lightroom CC and Photoshop CC, Adobe is also announcing the launch of their new stock photography service simply called Adobe Stock. Because Adobe is so widely used by creatives in general, leveraging their software products to sell an Adobe labeled stock photography library seems to make a lot of sense. Adobe’s stock photography service will be featured as a menu item in Photoshop and will allow stock buyers to use watermarked versions of stock photos to create mockups and test design/layout ideas. Once a stock buyer is ready to license an image they can license it directly from Photoshop and download the unwatermarked version of the image. Images will cost $9.99 each to license or Creative Cloud subscribers can purchase one of two different subscription plans. The first plan costs $29.99/month and allows a subscriber to license up to 10 images a month and a second plan will cost $199.99 per month and will allow a subscriber up to 750 images per month. Adobe will pay out 33% of their sales proceeds to photographers — photographers interested in applying can apply here. Because so many stock photography buyers are connected into Adobe’s ecosystem, I think this stock photography offering will end up being very successful and represents formidable competition to the current stock photography giant Getty Images. Earlier this year Adobe purchased the stock photography agency Fotolia, but this new stock offering appears to be a different offering marketed directly under the Adobe brand and available through Adobe’s flagship Photoshop product. More: MacRumors, The Verge, Engadget, Techmeme. Posted on April 24, 2013, 12:11 pm, by Thomas Hawk, under stock photography, Stocksy. Posted on March 25, 2013, 10:14 am, by Thomas Hawk, under stock photography, Stocksy. Dear Getty Images: I quit. I just sent Getty Images the email above, which, I think, is how I terminate my relationship with them. Hopefully. I’m not 100% sure, but I can’t seem to figure out any way to do it online, so I’m hoping that email works. Well, I’m sitting here typing this at 4:56 in the morning on my “vacation,” getting ready to get an early up to the top of a mountain in Idaho to shoot sunrise and I’m not a skier. It’s dark, it’s cold — and maybe, just maybe, with $10,000 worth of camera gear on my back, I’ll get something that works from this shoot. After I shoot several thousand images today I’ll go home and spend hours and hours processing them. Finally, I’ll upload them online and maybe sell some. If I do sell some though, bottom line is I feel that I’m getting ripped off with Getty’s lousy 20% payout. I don’t care how you look at it, for me, 20% is not fair. It’s too low. I’ve been complaining about it for years, but have just grumbled along because Getty felt like the only game in town for stock photo sales. Artists and photographers *deserve* more than 20% payouts. I understand that Getty has the buyers, that Getty is the 800 pound gorilla, but still, photographers deserve a better split than 80/20 against them. There are other reasons why I’m quitting Getty Images too though. In the private, closed, Getty Photographers group, managed by Getty on Flickr, there were almost 3,500 replies to a thread about Getty’s deal with Google Drive. Whatever you think about this deal, there are ALOT of photographers who are unhappy at Getty about an arrangement where they receive a pittance for their work. The 20% payout is already pretty low, but when you combine it with a $12 image buy, some photographers feel that was pushing things too far. The fact that Getty made this deal doesn’t bother me as much as how they’ve handled the criticism from their members over it. The above mentioned thread is now closed and locked by Getty Images. As a result of the thread, a member was banned and removed from the group — this is the second time that a Getty photographer has been booted from this group that I know of. 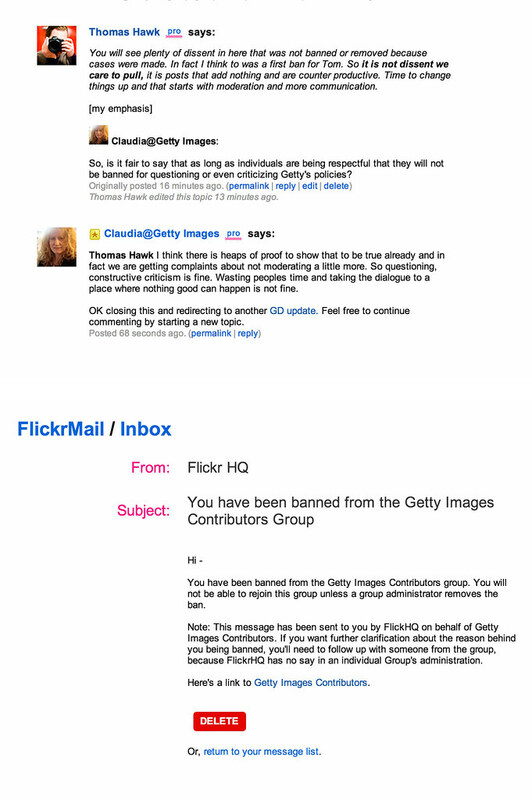 An earlier member Alex Hibbert was also banned for criticizing Getty. One of the Getty admins in the group, said that the more recent member was booted not because of his criticism, but because he wasn’t respectful with his criticism. I asked the question if respectful criticism would be allowed to stand and was told yes. I’m going to post this blog post into that forum and I guess we’ll see if this is true. For me, while critical, this post is entirely respectful. I’m still not sure it will get to stay there though. When you start to see a company fighting with it’s contributors, banning contributors, even FIRING contributors, it makes me feel like maybe it’s time to go. This doesn’t feel like a healthy “relationship” any more. Paying me 20% and keeping 80% already felt a little insulting, but I think we deserve to be treated better. This has been the hardest part of all about leaving Getty earlier, there didn’t really seem like there was any place good to go — before today. Today I’m pleased to announce that I’m going to start selling my stock photos on Stocksy. Stocksy is a revolutionary new photo agency started by Bruce Livingstone, the founder of iStockphoto. A lot of my friends are there selling photos now too. I’m pleased to be joining some of the most talented photographers I know in a new sort of photographer-owned coop. Now THAT is an idea that I can get behind, and one that’s been long overdue. Fairly compensating photographers while running an agency with some of the most talented photographers in the world today? Sign me up! Today Stocksy is launching to the rest of the world. You can read more about that here. If you are a photographer, consider signing up. One bit of warning here though, Stocksy is being *very* selective about the photographers that they are adding. I have felt a little bad because some of my good friends and talented photographers haven’t been asked to join. Especially early on, Stocksy is trying to build a super premium library of images and sometimes this means making hard choices about who you will launch with. They are also trying to keep Stocksy small where the editors and members can know each other on a personal level. I’ve already made lots of new friends at Stocksy and I’ve appreciated the valuable advice that the editors there share with me about why an image may or may not be right. At Stocksy editors and management do Google+ hangouts with photographers. At Getty all they seem to do is fight. If you are an image buyer, consider looking at images on Stocksy the next time you need to buy. Not only will you find some of the best, fresh, and most authentic images in the marketplace today, you can feel good about buying them, knowing that they are treating the photographers fairly. As fellow creative professionals, you are one of us — if given a choice, where would you rather your money go — to actual photographers who create the images, or to Carlyle? Even if you don’t care, still give Stocksy a look, because the imagery there really is miles ahead of what you see in the run of the mill stock photography library out there today. Let Stocksy make you and your clients look the best they possibly can. You are the ones we need to embrace this idea most of all. I’ll blog more about Stocksy as time goes on. For stock photography it will be the primary place where I market my own images (like the other photographer members my images for sale on Stocksy will be exclusively offered there) and I’m looking forward to a long and successful relationship. Here’s Stocksy’s announcement on today’s launch. Update: well that was fast. I’ve been banned from Getty’s Forum. I’m fine with that as I’m not a member, but I’m told that my post criticizing them has also been deleted. I hope those that are still in the forum can keep up the good fight, demanding more for photographers. I’m disappointed (although not surprised) that after being told that respectful criticism would be allowed that Getty deleted my respectful criticism there. Update #2: More from Stephen Shankland over at CNET. PetaPixel republished my article as a guest post here. My good friend Trey Ratcliff is also joining Stocksy. Update #3: Fast Company’s article on Stocksy here. Update #4: a good overview about the buzz around Stocksy. Think You Can Sell That Photo of Your Cat on Your Living Room Couch as Stock Photography? Think Again. Posted on February 13, 2012, 4:00 pm, by Thomas Hawk, under Getty Images, stock photography. 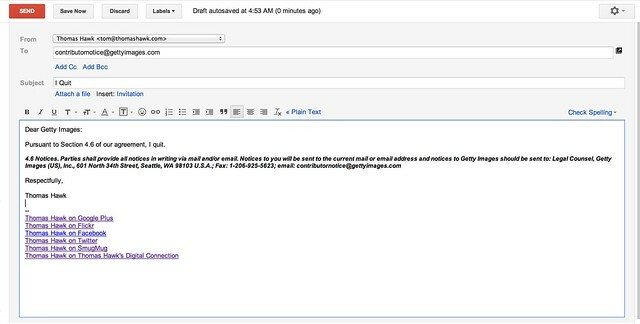 I just got an email from Getty Images that I suspect is a mass email to all of their various contributors. 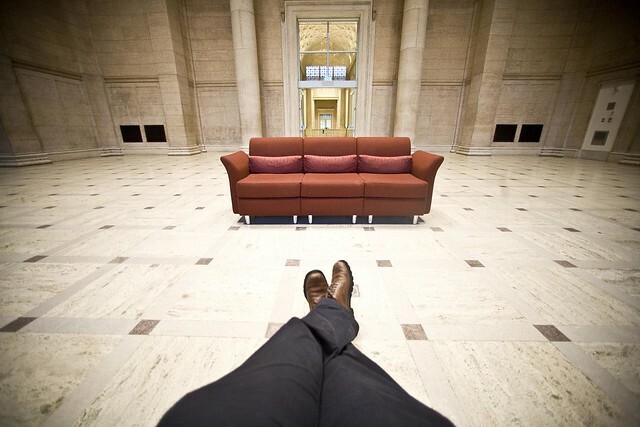 In the email Getty is asking for help in identifying our photographs that might contain images of designer furniture. The email states that French courts have found in favor of the Le Corbusier rights-holders against Getty in a case where furniture was in the stock photograph. “Attention all Flickr Collection on Getty Images Contributors! You may have heard about a recent case (actually more than one case) where Getty Images and some of our photographers have had claims lodged against us in French court for images which include designer furniture, even as a minor part of the image. This is a serious issue that involves potential liability for you as photographers. The French courts have found in favor of the Le Corbusier rights-holders who initiated these claims. While we disagree with the decision and we are appealing it, we are very mindful that for now, it is a valid decision. It is critical that you understand that any claim like this one is extremely serious and requires action on your part in order to protect your interests, not just ours. We will continue to fight this decision, but in the meantime we must continue to actively pull content from our site that may be deemed infringing. We simply cannot identify all problematic images as quickly without your active participation. And quick action is vital. Most importantly, if you believe that any of the images you have uploaded to us might possibly include any designer furniture, please email the Getty Images ID numbers to [email redacted] as soon as possible! The sooner we can identify and remove potentially infringing images the better we can reduce potential legal problems. We are including links to information and FAQs that give more information on this issue and we strongly request that you read them and study the visual guides included. Please note: because we are still engaged in litigation, we are very limited in what comments we can make or questions we can answer. If you do have questions please email [email redacted] especially for any specific images you believe may be a problem. This is only for images you have on the gettyimages.com site. We cannot answer questions about images you have posted on Flickr or elsewhere. Posted on December 18, 2009, 1:19 pm, by Thomas Hawk, under Flickr, Getty Images, stock photography. Over at the Getty Images Contributor Group on Flickr (it’s private and you have to be an accepted Flickr/Getty photographer in order to see it) there have been a number of threads started over the past few months where Getty/Flickr contributors have posted and shared basic information about how their sales are going through the Flickr/Getty partnership thus far. While it is probably far too early to accurately ascertain a lot of the statistics on how things are truly going, I thought I’d compile some of this information as anecdotal. So far the Flickr/Getty deal has been running about 8 months now. Initially Getty editors scoured Flickr finding images and photographers to invite. More recently Getty has created a “Call for Artists” group where Flickr users can apply for participation directly in this program. Also Getty has broadened the submission process now allowing photographers to submit 25 images per week for Getty to consider for the Flickr collection (for a while it was 50 per week but they just cut it back to 25). Getty/Flickr photographers submit these images to the “Getty Images Artists Picks” group for consideration. 1. One of the threads in the Contributor Group asked the simple question of members how many images each member currently had on sale at Getty. So far 25 photographers have responded in that thread with an answer. The largest answer was 566 photographs. The smallest answer was 3 photographs. The average of the photographers who answered was 133.4 images each. 2. Another thread in the group asked a more complicated question, what each photographer’s Return Per Image per year was (RPI). In order to get this photographers took their total earnings, divided it by number of months images had sold and the multiplied that number by 12 to get an annual number. The idea here is that photographers might see how much each image accepted by Getty might be worth to them on an annual basis. 22 photographers answered this thread. The highest RPI came in at $119.16 per image. The lowest was $0 (by two photographers who had yet to sell images). The average was $31.03 per image. 3. The most participated in question had to do with Getty’s acceptance rate for images submitted. During the months of August, September, and October, Getty allowed Getty/Flickr photographers to submit photographs in sets to be considered by Getty editors for sale. 39 photographers responded to this question. 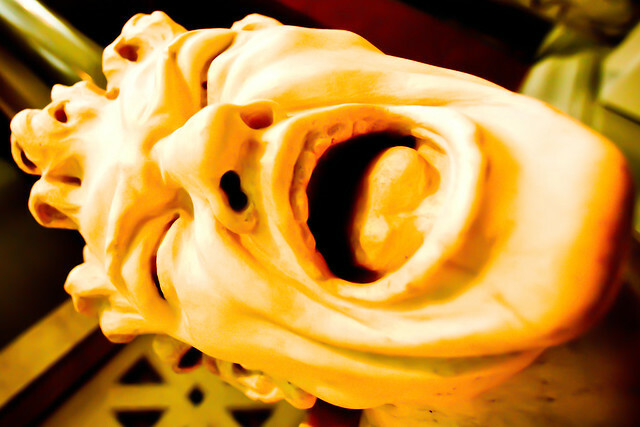 Acceptance rates varied from 100% of images submitted accepted to a low of 5%. The average acceptance rate for images submitted to Getty through this program was 48.25%. 4. Finally, one photographer asked Flickr/Getty photographers to post the highest right’s managed (RM) sale that they’d made to date. Right’s managed images sold by Getty generally sell for higher amounts than the royalty free (RF) images that they also offer. Many photographers only have royalty free offerings up right now, so much fewer photographers responded to this question. A total of five photographers responded to this question. The most expensive RM image in the program thus far was reported to have sold for $1,439. The low number for highest sold RM photo was $741. The average high value sale was $1,057.75. It should be noted that several Flickr/Getty photographers have posted that there seems to be a lag from the time that their images are being accepted by Getty and keyworded for accurate search on the site, so this may also be a factor to consider. In general Getty Images pays out 20% for RF images and 30% for RM images to photographers. At present there are 13,094 Flickr members in the Getty Contributors group. Getty had previously reported having over 60,000 images now in the Flickr/Getty collection. A current search of the entire Flickr/Getty library pulls up 74,313 images. These numbers would suggest that the average number of photos per Flickr/Getty photographer on sale is much lower than the self reported number above. This would make sense though as it’s probably mostly the most active Flickr/Getty photographers who are actively participating in the Getty Images Contributor group on Flickr. I suspect that the vast majority of photographers in the program probably have less than 10 images for sale each at present. A blank search for all creative images for sale at Getty at present would suggest that the current Creative collection at Getty (vs. editorial) has about 2,781,826 images in it. This would mean that Flickr would likely represent about 2.6% of the entire Getty creative catalog at present. A number which I suspect will likely be increasing in the future assuming the Getty/Flickr deal stays in place as is. You can follow information on the Getty/Flickr partnership on Twitter here. Getty’s main account on Twitter is here. Getty Images is on Friendfeed here and Facebook here. If you’d like to nominate a Flickr photographer to be invited by Getty you can email a link to their flickrstream to flickr@gettyimages.com. Posted on November 5, 2009, 12:26 pm, by Thomas Hawk, under Flickr, Getty Images, stock photography. A few weeks ago I wrote a post about my first six months experience selling images through Getty’s Flickr Collection. While overall I’ve been pleased with my experience with Getty, one of the things that I always felt was a limitation was the fact that the Getty/Flickr program was invite only. And while literally thousands of Flickr photographers have been invited thus far (the Flickr/Getty private member only contributor group on Flickr counts over 12,000 members and Getty says that the collection now includes over 60,000 photographs) there wasn’t really a way for a photographer to try and be included in the program if they didn’t get a Flickr invite. Today Getty Images and Flickr announced a “Call for Artists”, which will provide the Flickr community with a forum to “pitch” their work for the collection. In the past, the Flickr community could set their account settings to reflect that they wanted to be contacted by Getty Images, but could not proactively present a portfolio of photos for consideration. If Getty has not contacted you yet and you think that you’d like to try and make some money selling through Getty, this will be a group that you will definitely be interested in. Andy Saunders, Vice President of Creative Imagery for Getty Images, has more details on this new program over at the Getty blog here. Basically, Getty is asking photographers who might be interested in this program to put together a portfolio of 10 photographs (no more, no less) to submit to the group pool. Getty wants you to upload them all at once and then there editors will review them and possibly invite you to be included in the program. Keep in mind, with Getty you will want to be mindful of the images you choose to submit. Don’t submit images of people where you don’t have / can’t get a model release. Don’t submit photos that show brand logos or prominent places that would require a property release (unless you can get the release). You’ll also want to make sure that the images are at least 3 megapixels in size. Once you submit your photos it may take them a few weeks to get to you. Congratulations to Flickr and Getty on expanding this successful program. While I don’t think any individual photographers are exactly getting rich off of the Getty deal yet, I do think that this program is a terrific way to earn extra money on your flickrstream and at least help in getting you that new lens or full frame DSLR tha t you’ve had your eye on. If you’d like to see the images that Getty Images is currently representing of mine you can see those here. Posted on October 20, 2009, 12:45 pm, by Thomas Hawk, under Getty Images, stock photography. A few months back I wrote a blog post detailing my experience selling stock photography through both Getty Images’ Flickr Collection program as well as a new program allowing you to sell your photography through ClusterShot. The title of my post “Is 20% of something better than 88% of nothing” compared my own experience with the companies and my sales through the companies as of last May. Getty pays out about 20% for royalty free images while ClusterShot pays out 88%. Today I just received my sixth monthly statement from Getty Images and I thought it an appropriate time to revist my experience selling stock photography through both companies. At present I’ve got 68 images offered for sale through Getty. You can see my Getty images for sale here. For my first six months in the program I’ve earned $883.35 from the sale of 22 images. At present I’ve got 30,848 images offered for sale through ClusterShot. You can see my Clustershot images for sale here. So far I’ve earned $338.80 from the sale of 3 images. I have to say that I’m pleased that I’ve sold any photos at all through ClusterShot. I was not sure how that was going to go as ClusterShot is a new start up vs. Getty Images as the industry leader in stock photography. There is a lot that I like about ClusterShot. Their 88% payout to photographers is *very* generous vs. Getty’s 20% payout. I like that I’m not locked into or committed to any exclusivity agreement with images from ClusterShot. I like that I can market *all* of my photos through ClusterShot and not just the ones selected by Getty editors. I also like that ClusterShot flows seamlessly through Flickr and I can just point my ClusterShot account to my Flickrstream and through the API have my images automatically pulled into ClusterShot without having to do any work on my part. ClusterShot also seems to be indexing well with Google and I’ve received both sales and queries regarding my photos through Google searches. On the other hand I think Getty is by far the more professionally oriented stock photography agency. Getty ensures that images are cleared correctly. They require model and location releases where needed. They have the marketing clout behind the largest stock photography agency in the world. As a photographer ClusterShot is much more appealing to me than Getty in a lot of ways. Certainly I hope that they gain significant market share going forward and that more and more image buyers considering using them. They seem very committed to providing the lion share of image profits to the actual creator of the image, you the photographer. I do also hope that new ventures like ClusterShot end up putting pressure on agencies like Getty to bring the payouts up a bit higher than where they are today. The vast majority of my image licensing profits still come directly. People find my images on Google Image Search, or Flickr, or Zooomr, or FriendFeed or other sites and simply contact me directly about licensing them. Best of all those sales still pay out 100% to me the photographer. Does anyone else out there have experience selling images with Getty/Flickr or ClusterShot? If so what are your experiences. If you are an image buyer what do you think of these two programs? Posted on September 23, 2009, 11:28 am, by Thomas Hawk, under stock photography. More activity in the stock photography market today. First bit of news is that iStockphoto is getting into the logos business. iStockphoto already sells cheap photos, video footage, audio clips, flash animation, illustrations and other content, so this would just seem to be a logical extension of their marketing cheap content to small (and sometimes larger) businesses. Many small businesses, I would think, might find these logos interesting. I tried out Logoworks’ service a few years back and thought it was interesting. Logoworks was later sold to HP. This would seem like a logical move for iStockphoto to make. The second bit of news is that Shutterstock has purchased BigStockPhoto. I’ve never used either of these services so I’m not really qualified to comment on them. Presently I’m marketing my own images through the Flickr/Getty partnership and ClusterShot. Press release from Shutterstock here. More details and comments on these two stories from TechCrunch (iStockphoto and Shutterstock). Posted on September 15, 2009, 3:09 pm, by Thomas Hawk, under stock photography. iStockphoto will announce tomorrow an interesting new twist to their stock photography offerings. Beginning tomorrow, all purchases at the microstock agency (including photos, videos, illustrations and audio) will be guaranteed up to $10,000 in damages at no additional cost to the image buyer. What many people do not know is that they when they buy and use an image for commercial purposes, the majority of the liability over any unauthorized use is with the publisher of the image. This means that even if you buy an image from a stock photography website that you are not exempt from a possible lawsuit if it somehow turns out that the image wasn’t actually authorized for sale by the creator. Although misrepresentations are rare, they can happen (and have happened even at iStockphoto in the past), but this new immediate and automatic protection from iStockphoto means that, at least in terms of smaller claims, you’ll have more automatic protection. What makes unauthorized photo usage even more costly, is that generally speaking an image creator can sue for even more than just damages if the infringement is considered “willful.” By offering this protection, iStockphoto gives you peace of mind at least on the first $10,000 which would likely cover most small business usage claims. An exact determination into what kind of clearance an image might need is not always easy. Some cases involving models are pretty straightforward and need model releases. But other cases (often involving property releases) can be a bit trickier to navigate. iStockphoto also maintains a wiki where they discuss some of this less clear cut issues. iStockphoto is a wholly owned subsidiary of Getty Images.